Myself and my wife booked an off season special offer for two people. We were worried about the low price but need not have been. On arrival the chateau was as described and the two of us had as promised exclusive use. The day time weather at the end of September was warm and sunny although the evenings were rather chilly. Gerald provided us with logs and the memories of the evenings around the log fire remain a happy memory. What impressed us first of all was the rapid response to our email enquiry and the care given regarding our various questions about our travel plans. On arrival the property was exactly as described, clean, tidy and well presented. We were amazed at the Oak staircase and Minstrels Gallery, it was like a set from "Gone with the Wind". We ate for the first time frogs and snails in a local family restaurant now run by the fourth generation. The Michelin starred restaurant Troisgros was incredible and following Gerald's advice we also tried the Moulin de Rongefer, 25€ for a complete meal including cheese and dessert. A meal of great imagination, all beautifully presented, it would have cost at least £50 in England. Our two sons descended the Loire by canoe and we met for lunch at the Restaurant de la Loire which is right on the banks of the River, another excellent meal by a Troisgros trained chef. The entire family enjoyed Lake Sapin with its forest adventure trail, sailing, horse riding etc. Gerald arranged for a vineyard visit to Simon Hawkins an Englishman who has owned the vineyard for more than 20 years. We tried his famous 7 sparkling wine which is dedicated to the holiday route National 7 which passes through the nearby town. 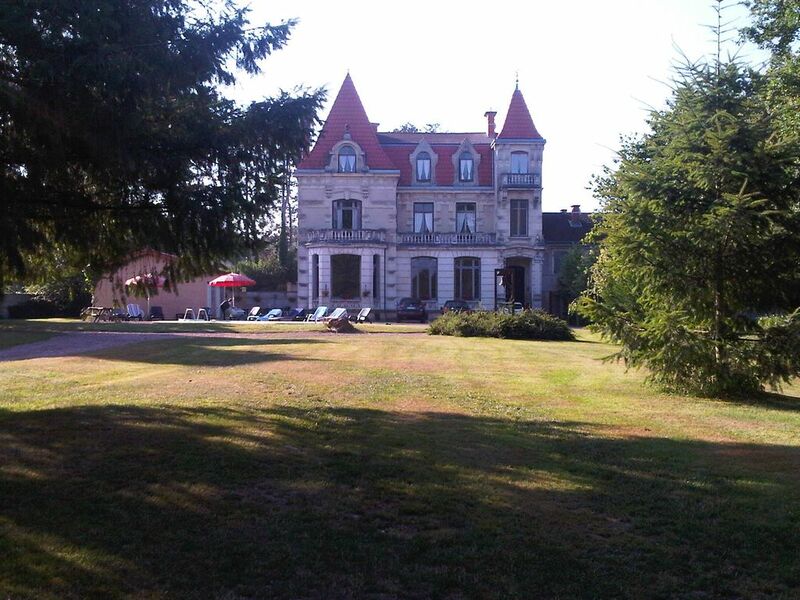 Not to forget the chateau itself, each morning we bought croissants from the local bakery and had breakfast in the sunshine by the pool. My elderly parents practically took up home under the shade of a magnificent old oak tree in the grounds and spent the time reading. My husbands first visit to France and the chateau was an amazing destination. Wonderful weather, friendly people and so much to see and do. We will definitely be coming back. All towels and Bed linen included. No pets All bookings Sat to Sat.